Why the entrance? Well, Disneyland doesn’t spare any detail, no matter how lowly the passageway might be. 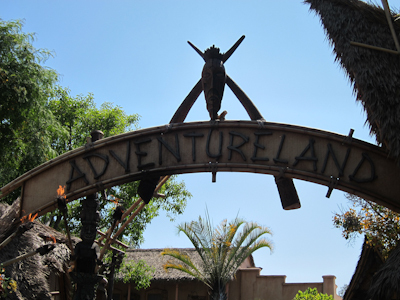 Of course, the entrance to Adventureland is anything but lowly. It has an impressive arch across the bridge. 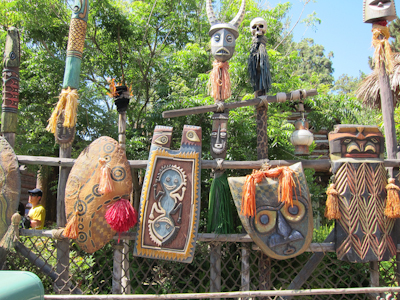 The right-hand side is filled with exotic looking tribal looking masks. I do not believe these are supposed to represent any particular culture. 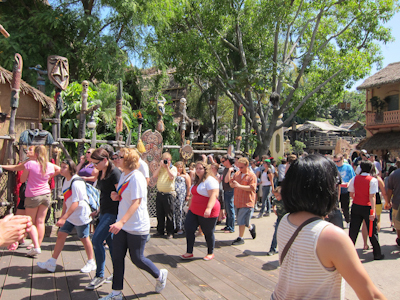 Over on the left-hand side is the Enchanted Tiki Room. Now this is an attraction that doesn’t get as much love as it should. It was one of Walt’s favorite attractions (he was really big on the audio animatronics) yet it’s just not popular these days. What IS popular, however, is the Dole Whip window attached to the Tiki Room. Here you can get pineapple juice and the infamous Dole Whip. Well, infamous if you happen to have heard of it before. The Dole Whip is not ice cream, nor is it frozen yogurt. It is a frozen dairy product all of its own making. And the people who love Dole Whips REALLY REALLY love Dole Whips. As for me, I’m only mildly excited by the Dole Whip and only get them on very rare occasions. Now this is a VERY important point, so I hope you’re paying attention. The Dole Whip counter usually has quite a line. Here’s the important part: some people will accidentally mistake the line for a Dole Whip to be a line for the Tiki Room. This is not the case! 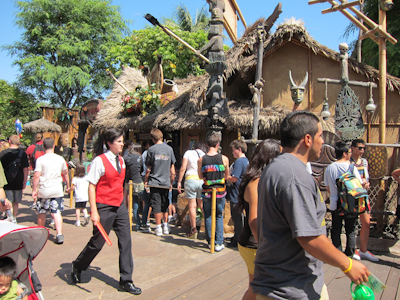 Only on very rare circumstances does the Tiki Room have a line. If you are interested in seeing the Tiki Room and you find yourself in line, it would behoove you to check and make sure you’re not standing in line for a Dole Whip. And incidentally, if you want both a Dole Whip AND to see the Tiki Room, there is a Dole Whip window inside the Tiki Room waiting area. 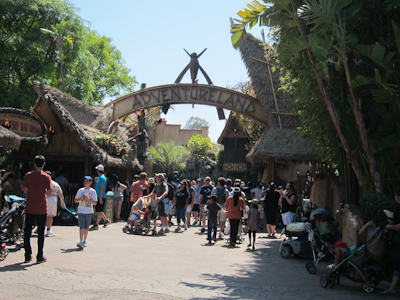 And finally–one more very important feature of the Adventureland Entrance is the bathrooms. 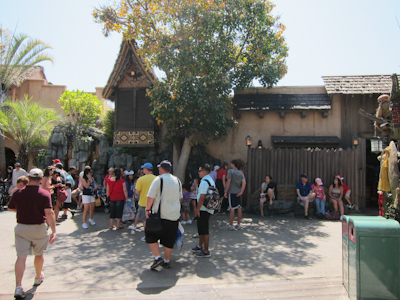 I honestly believe that these restrooms are the most crowded restrooms in the entire park. Seriously. I am not a fan. I really think you should either hit the one behind the Carnation Cafe (my personal favorite) or the one in New Orleans Square by the French Market. And of course, if you have a baby, use the Baby Care Center. And speaking of restrooms, the Happiest Potties On Earth is a great rating system for all Disneyland restrooms.